Reading in bed can be a lovely way to end a stressful day, but without proper lighting it’s hard on your eyes. You can use a lamp, but if you share a room with someone it will keep them from sleeping. Should you happen to share a bed with someone as well, then even an attachable book light might be enough to keep them up as it is a focused light pointing down towards the page. For those who are not sitting up the bulb is visible and is as bright as the sun (not really, but you get my meaning). If you still want to read, but without having to use copious amounts of light to make it easy on your eyes and your significant other, then the PageGlow might be your new favorite toy. 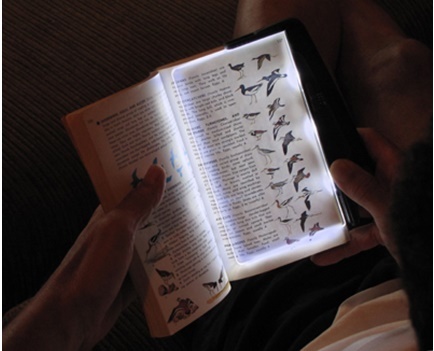 This is a rechargeable, portable, ultra-bright LED book light that will spread the illumination of 3 LEDs across a page without letting much light bleed off into your surroundings. It uses a 3 stage dimming switch, so you don’t have to turn it on and be stuck with one level of brightness the entire time. There’s an ergonomic thumb groove to help your hand from tiring out holding the pages open, and a page clip to easily place the light on your reading material. It will use a USB cable to recharge, which means you can plug it in at your desk and grab it as you’re heading to bed in the evenings. This will cost you around $30, and is perfect for any bookworm who just can’t help but keep reading one more chapter before drifting off to sleep.